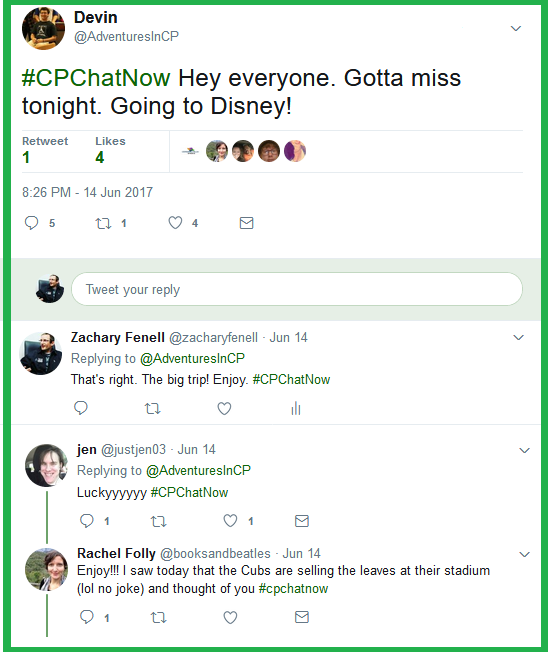 Wednesday, June 14th, 2017 participants who joined #CPChatNow experienced a stroll down memory lane. 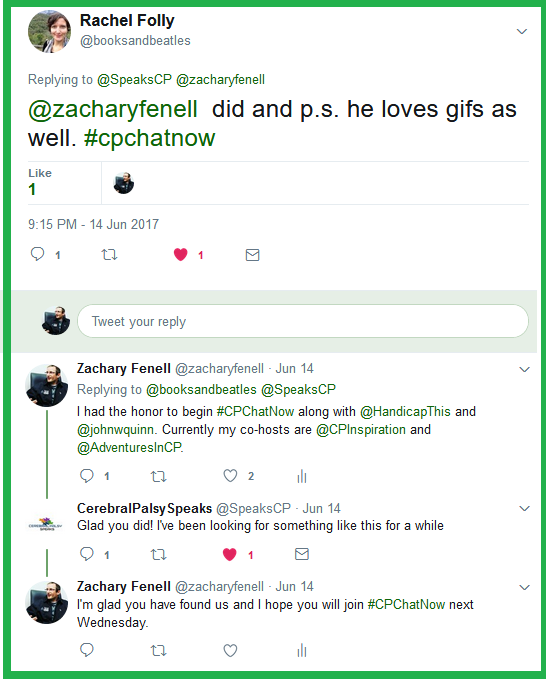 I am Zachary Fenell, a proud #CPChatNow co-founder and current chat co-host. Fittingly I receive the pleasure to recap the June 14th, 2017 chat. This should feel like writing a #CPChatNow history lesson! Before delving into our history though, you might notice a certain someone missing from the highlights. 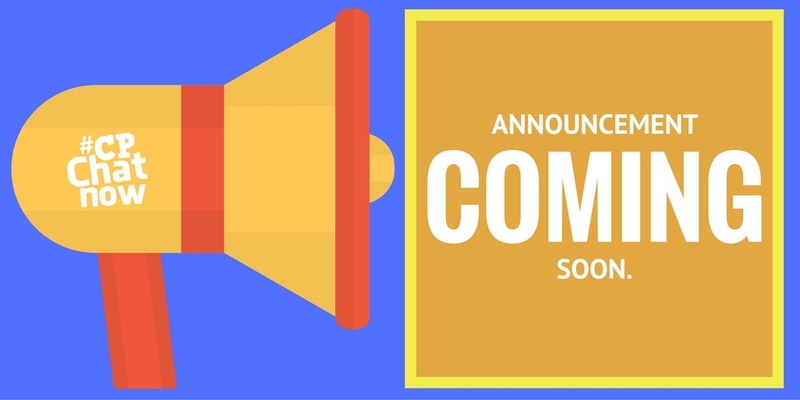 Last week my co-host Blake Henry and I announced Devin Axtman‘s move to permanent co-host. He, Blake, and I will all work together to serve our community. Anyhow, Devin to celebrate his new promotion possessed special plans June 14th. Now, I am joking around about the reason for Devin’s visit to Disney World. I know he planned the trip months ago. 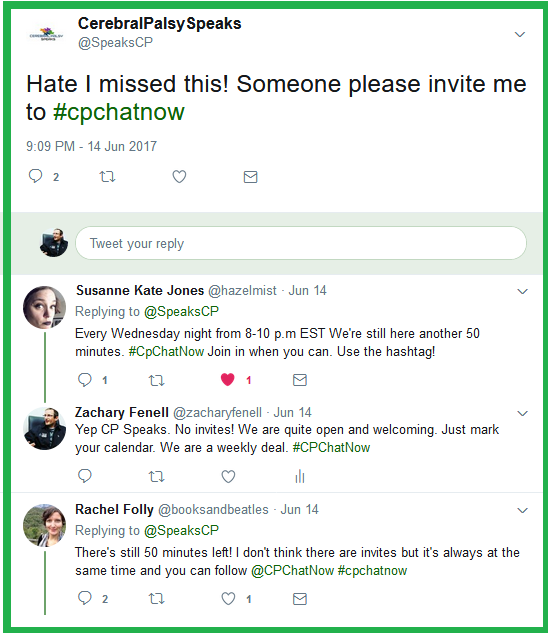 The timing with his #CPChatNow co-host promotion just proved too tempting. I couldn’t resist the “I’m going to Disney!” joke. Moving along, the previously mentioned stroll down memory lane’s catalyst came when some new faces emerged. Upon learning Christine Ruiz‘s newbie status, Susanne Kate Jones teased some hazing. Christine’s response indicated she will likely fit right in with our humorous bunch. Thankfully Christine caught onto the comedic tone behind Susanne’s remarks. Another newcomer surfaced a little past our second hour. Based off participants’ responses, I am glad CerebralPalsySpeaks asked. After all, every party involved in the origins deserves credit. 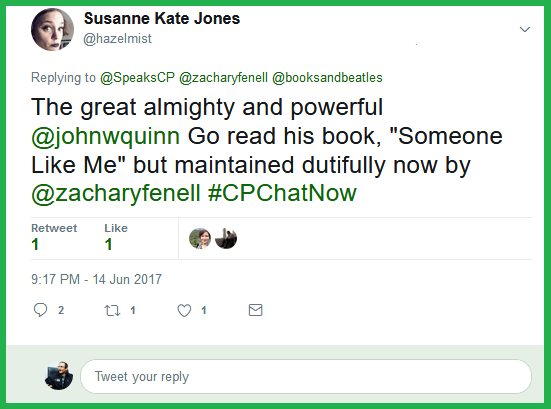 Susanne credited Someone Like Me author John W. Quinn as the #CPChatNow originator. Meanwhile Rachel Folly gave said distinction to me. Both remained partially correct. John and I each explained we together with Handicap This founded the hashtag. 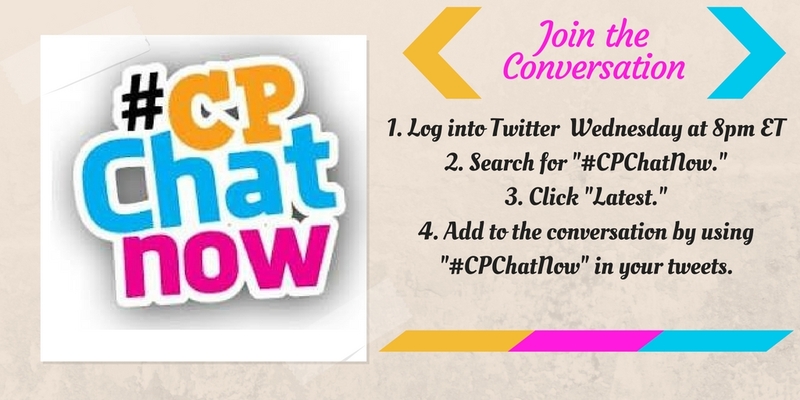 I offered up the visual evidence, tweeting out the promotional image we used to promote the very first #CPChatNow. Long-time #CPChatNow regular Hannah Pike remembered seeing the image. She admitted letting shyness keep her away initially. 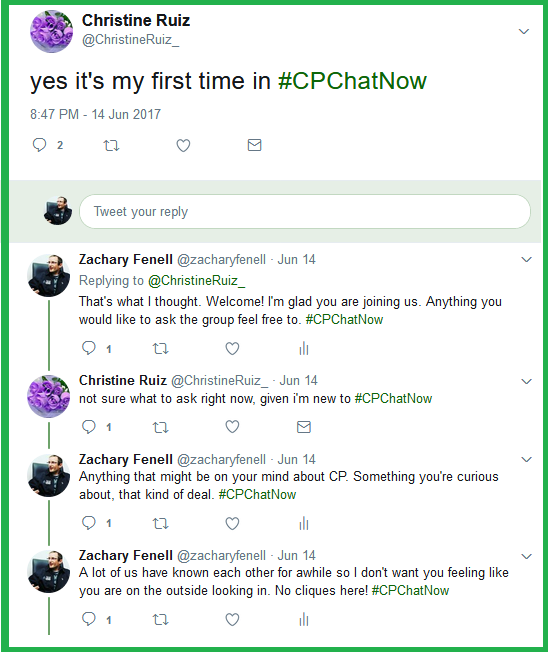 That caused me to joke since the #CPChatNow train design shirt we sold last year extends back to a life experience Hannah once shared with us. 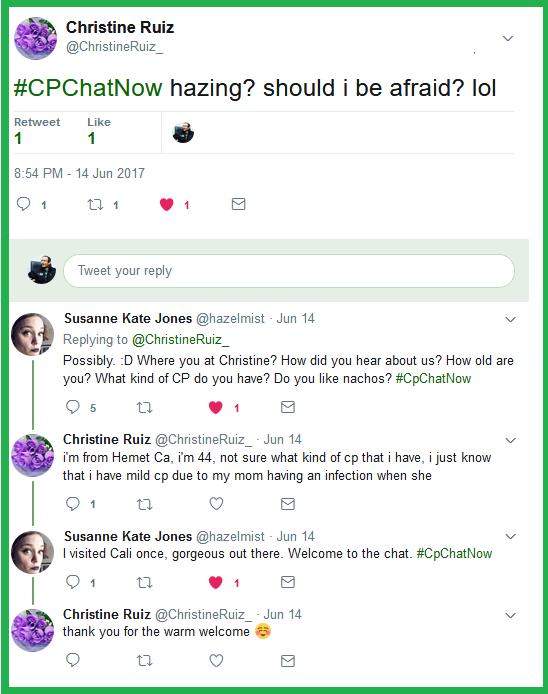 The joke surprised Susanne who didn’t know #CPChatNow apparel existed. In 2016 we at #CPChatNow held two shirt sales using Custom Cat. Proceeds went to Handicap This’ non-profit Keep On Keeping On Foundation. Between the two sales we raised $170 for KOKO. If interested in us relaunching the shirt sale, tell us! 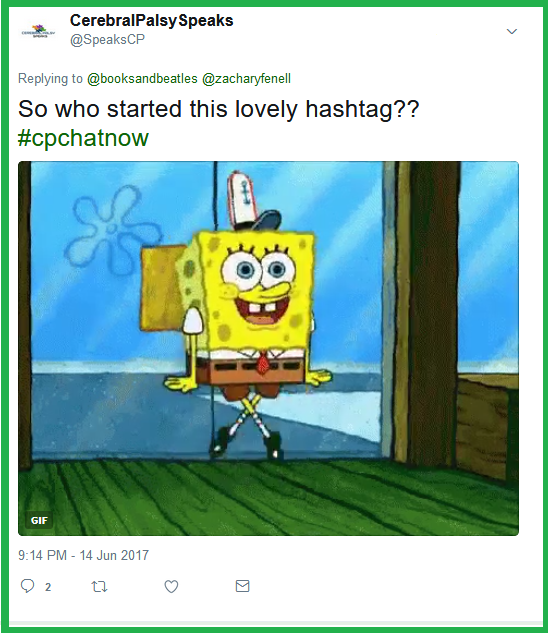 Also why not contribute to the #CPChatNow history lesson? 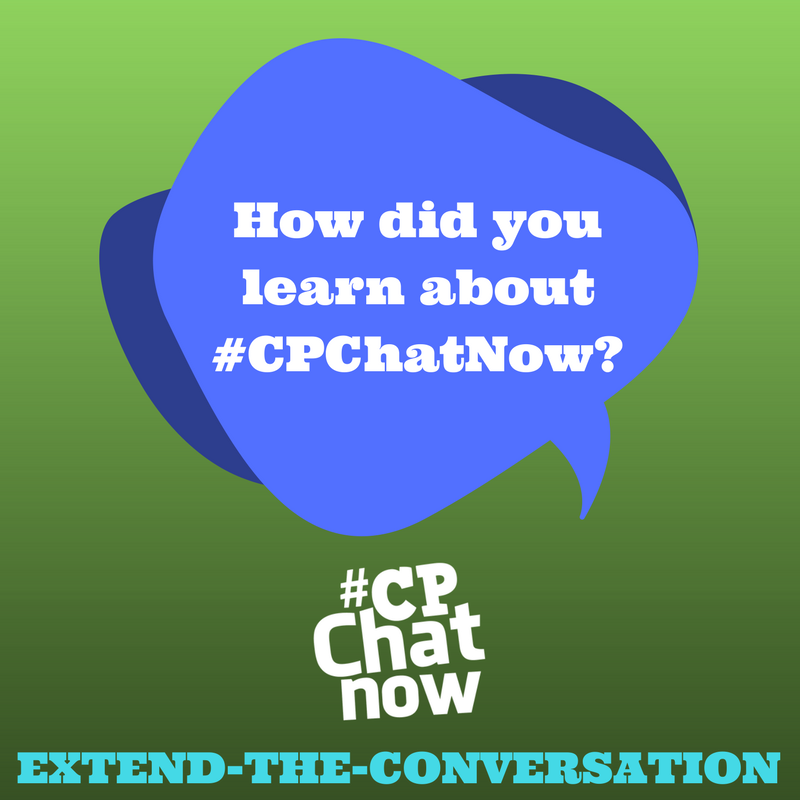 Answer for the week’s extend-the-conversation question, “How did you learn about #CPChatNow?” Respond by commenting below! This entry was posted in Weekly Recaps and tagged cpchatnow origins, handicap this, john w. quinn, zachary fenell. Bookmark the permalink.